Quite the racket at our remodel on San Juan Island this week. Outside, men on beams like cats are deconstructing a deck, board by board. Throwing them all overboard. Pharrell Williams’ song “Happy” plays on a portable radio that has seen better days. What is to be my writing hut is currently at use as a construction shed. Large pieces of plywood are being ripped down for the building of bookcases in the house. At the garage, wood is being cut on a table saw, half in, half out. Booted steps on the stairs carry the boards inside. A symphony of sounds: air compressors firing up and the rapid popping of nail guns going off, followed by the buzz of an electric sander. And for a grand finale, the vacuum cleaner sound of a paint sprayer. All in a day’s work. Our little dog is looking to hide, whereas I am over the moon. Ecstatic. We have moved off the boat and into the house. It is still a job site, but with the construction of the bookcases the contractors will be finishing up indoors, and all out on the decks. It makes sense that I come in with the books. Sacred stuff, books. My whole life was on hold while the books were in boxes. 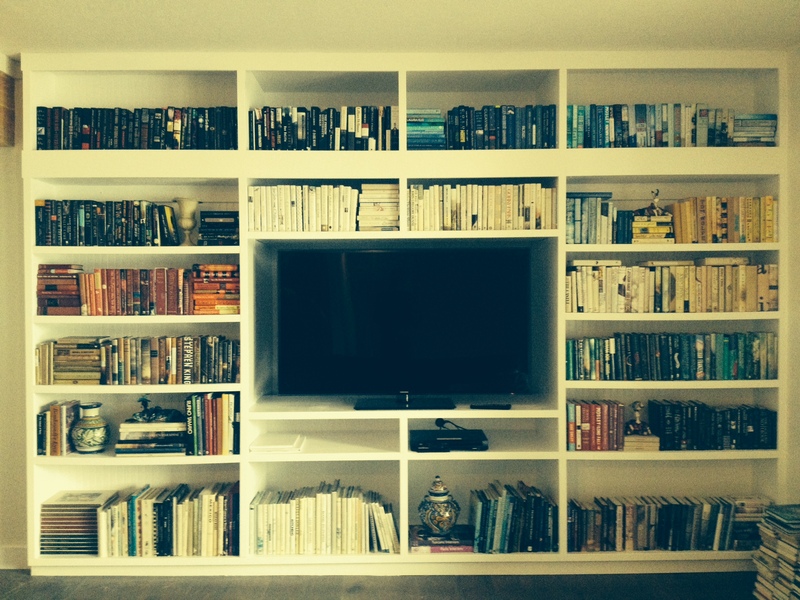 And the architecture of bookcases is nothing less than temples or cathedrals to me. Considering the height of the ceiling, we will be worshipping with the help of a library ladder. How did it come to this, this wonderfully abundant bohemian love of books in the span of a lifetime? In the house where I grew up, the bookcase was stocked with regularly updated The World Book Encyclopedia, yards of National Geographic magazines in their distinctive school bus yellow binding, a set of Harvard Classics from my father’s father, Time/Life series of art history books: Medieval, The Renaissance, and so on. And although I know I’m forgetting other notable sets, Readers Digest Condensed Books. Everything in sets, in other words. What was with that? I can’t say I remember real books upon those shelves. Look at me now. A confirmed bibliophile. And if it seems I was a book snob before I became a bibliophile, I think you are right. For I could sense, growing up, that something was not right. We lived close to the center of town where a Carnegie style public library perched on high over the town green, but there was no local bookstore. Today I can’t imagine living anywhere without a bookstore. Did everyone use the library then? Were people not reading as much, or just not needing to own what they read? Nevertheless there were three good role models for me in those days. People who had to have books. Nana, Miggs, and Marcia. A 98 lb. grandmother who devoured Agatha Christie novels in paperback. Hard to believe the English crime novelist could be so prolific, but sixty-six books flew off her desk along with a host of short stories collections. Frail little Nana had her arms-full and they kept her up late at night. Miggs was the mother of one of my best friends. Needless to say I spent a lot of time at her house, a charming Cape appointed with antiques, original oil paintings, and books. A built-in bookshelf under the staircase, but more importantly, there were hardcover books all over the house. Where did she get these impressive books? My guess is she belonged to Book-of-the-Month type clubs, popular at the time. Her books came in the mail, much like my parents’ Time/Life sets. You had to subscribe, in other words. It was a different time, although not that different than ordering through Amazon, now that I think about it. Marcia, my godmother and aunt. Informed by the New York Times booklist, a voracious reader in a family of men, I remember her curled up on the sofa reading while they watched sports on television. Marcia gifted me books with the Caldecott seal and the like throughout my youth. These I kept in my room, and thus began the need for books by my side. When Aunt Marcia passed away I mourned all over again with the publication of each new book I was sure she would have loved. This process started with Frank McCourt’s Angeles Ashes and continues to this day with The Invention of Wings by Sue Monk Kidd. Marcia is active in my selection of books, reading over my shoulder with me. And it’s books, books, books, that I, in turn, gift her grandchildren today.